"Ways to Benefit from your social marketing strategy"
A strong Social media strategy benefits brands by sharpening the focus and consolidating efforts for maximum results. The social media strategy serves as a roadmap and is planned after reviewing the relevant channels and targeted consumer’s online behavior. But do you have a cohesive social media strategy across all your marketing efforts that let you optimize your return on marketing investment? What are the ways in which your business can benefit from a social media marketing strategy? Do social media marketing strategy lends itself towards reaching a current or prospective customer? Does social media strategy plan evaluate the results of each tactic and give a clear view of progress? How to plan and develop a perfect social media strategy that works like charm for your organization? 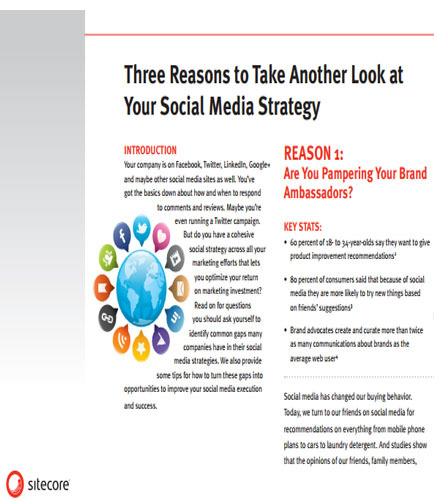 Download this whitepaper on “Three reasons to take another look at your social media strategy,” and apply the tips you need to turn those gaps into opportunities and improve the success of your social media campaigns.